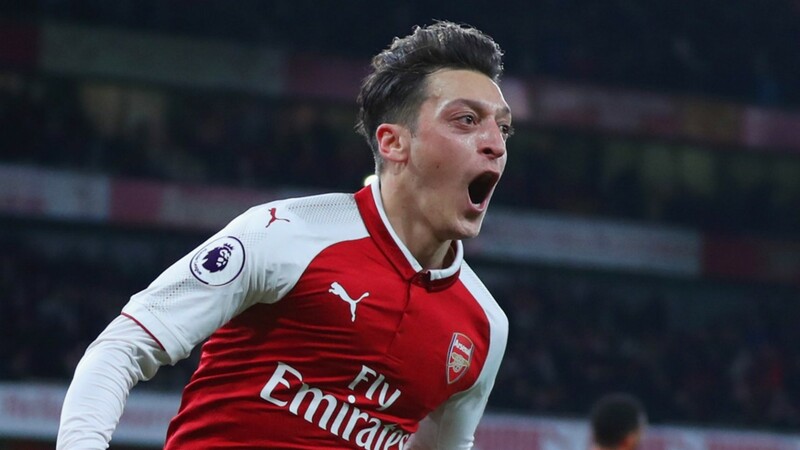 German midfielder, Mesut Ozil put in a scintillating display for Arsenal as art blitzed past Huddersfield at the Emirates stadium. The Gunners defeated The Terriers 5-0 courtesy of a brilliant attacking play by the Arsenal forward line. Ozil had a goal and 2 assists in a fantastic individual performance though Arsenal turned up the screw in the second half. Frenchman, Alexandre Lacazette started the party in the 3 rd minute but the opponents proved firm. No further goals in the first half occurred but a second half blitz took the Championship champions to the cleaners. Wenger made only 1 change to the side from the last game, with Mesut Ozil coming in for Nigerian international Alex Iwobi. David Wagner, the Huddersfield manager made six changes to the side that lost 2-1 to Manchester City at the weekend. Three goals in 5 second half minutes put the game beyond the reach of the visitors, with strikes from Giroud and Sanchez making the scoreline comfortable. Ozil capped up a fine individual performance with the 4th goal before Giroud netted his second of the game. The win maintains the Gunners perfect home record this term, with only their inconsistent away displays stopping them from being further up the league table. Arsenal have now won their last 12 home league games in a row, with only a 13-match winning sequence at Highbury (2005) being a longer run. Huddersfield looked solid defensively at the beginning of the match, but they crumbled in the face of increased pressure from the hosts. Ozil and Sanchez have been embroiled in contract standoffs with the Arsenal hierarchy, Ozil gave a performance that underlines his importance to the Arsenal team. He was majestic and looked a class above the rest of the players on the pitch.